A recent internet search for “3D printing additive manufacturing” yielded 1.1 million hits. To say that this technological development, even in its relative infancy, is a “hot topic” would be an understatement. Nonetheless, there may be perspectives on 3D printing that could do with some additional focus in order to help us understand its potential affects in managing supply to meet concomitant demand. 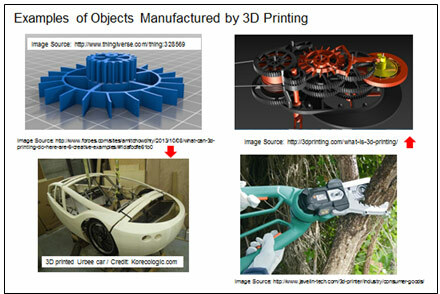 … will drive the adoption of 3D printing in many production industries. While the first two will have a more evolutionary effect on adoption the third, risk minimization, will have an accelerating effect. Three-dimensional (3D) printing of objects traditionally created by metalworking or injection molding continues to grow. After about 20 years of development, a technology previously confined to use by hobbyists and creators of prototypes is now capable of producing intermediate and finished goods on an industrial scale. 3D printing was first used to make prototypes of parts and assemblies in the mid-1980’s. Prior to this time, prototypes had to be manufactured with “traditional” manufacturing techniques, meaning that standard tools and machines would be used to make either a single (i.e., custom) version, or a very limited run for use in trial applications. This approach obviously made prototyping expensive. Prototyping became “rapid prototyping” when computer-aided design (CAD) helped to compress the design phase of the prototyping process. Prototyping then became even more rapid when CAD drawings were fed into a 3D printing program to complete the cycle. The best way to envision additive manufacturing is by thinking about a sculpture. The famous sculpture “David” may have always been inside that slab of marble (as some romantics might tell you), but Michelangelo sure needed to do a lot of “subtractive manufacturing” to get him out of there! 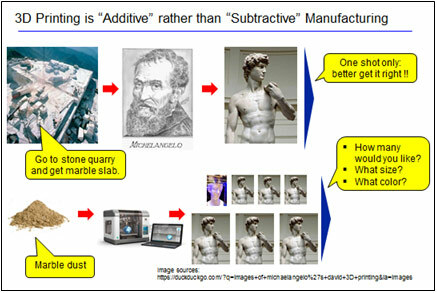 Imagine if, rather than hammering away at the marble, the great sculptor had been able to draw David with a Computer-Assisted Design (CAD) program, feed the output into a 3D printing application to generate a frame made of some type of mesh and then proceed to deposit marble dust onto that frame and build it up by “adding” layers? This scenario is, admittedly, not as romantic as the way it really happened, but it would have saved all that wasted marble dust that was left after David “emerged” from the slab! The same idea applies to manufacturing. Nuts, bolts, screws, baseball bats, tubing of all types, etc., etc. can be made without wasting material. However, there’s more! Those parts, components and subassemblies that are, in fact, amenable to being manufactured with this technology (e.g., many parts now made by either metal forming or injection molding for plastic components) can be made anywhere in the exact amounts that are required! How will the flexibility provided to the manufacturing process by 3D printing as described immediately above affect each economic driver of supply management? We will consider each in turn as well as their effects on each other. I like to say, “Economy of scale is to economics what gravity is to physics”. What do I mean by that? Every day we operate under the force of gravity. It is arguably the most important physical aspect of our environment. It is pervasive and ubiquitous so we don’t give it much thought. What’s more, we can’t get rid of it: but what if we could, say, cut it affects in half? Planes, for example, could be larger and travel faster with less fuel consumption. Economy of scale is kind of like gravity in this respect: we can’t get rid of it as the main driver of economic activity but, when new technology like 3D printing is introduced into the manufacturing environment, economy of scale will change. For example, consider a widget factory that has fixed costs (i.e., rent, heating fuel, electricity, insurance and any other costs that are incurred irrespective of production volume to keep the facility open and operating) of $1 million per year. Each widget also has variable costs (i.e., the inputs that go into making it) of 20 cents. 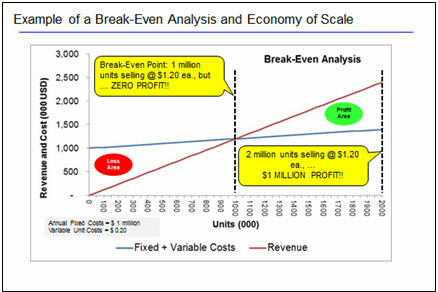 If the factory produces and sells 1 million widgets at a price of $1.20 each, it will just break even. The one-million-and-first widget will begin contributing to the factory’s profitability. If the factory can make and sell 2 million widgets, rather than just break-even it will earn a gross profit of $1 million. The scenario depicted immediately above is the basic universal driver of for-profit economic activity. Large facilities that produce many widgets that will drive down unit costs (thus enabling competitive pricing) are needed to stay competitive in the current “gravitational field”. Contrast this with a manufacturing environment that is enabled by 3D printing. 3D printing will enable smaller economical batch sizes. While the unit costs of these smaller batch sizes may be higher than those of the current high-volume centralized production environment, this “low-volume premium” will be offset by reduction in inventory, transportation and (for international shipments) Customs clearance costs. This will in turn enable the establishment of multiple lower volume production facilities that will be located closer to the final customer. Now that we’ve discussed Economy of Scale, we’ll move on with an example of the second big economic driver: the so-called “Long Tail”. Many people want to read the latest best-sellers. This, in turn, makes them even “better sellers”. There are also some people who are really interested in studying insects and would want very much want to read all 378 pages of “The Mating Habits of Mosquitoes in Montana” (we’ll assume, for the sake of illustration, that this book exists). Unlike our best-seller readers, these mosquito enthusiasts would have (in pre-internet days, certainly) difficulty in finding their book at a reasonable price, if at all! There are only a few of them in existence; the book is no longer in print and finding the few among them that are also up for sale made this task almost impossible. Of course, there are many books in this category because the number of moderate to low-demand books far outnumbers the best-sellers. If we ranked all book sales over, say, a given year and plotted the amounts on a vertical bar graph, it would look roughly like the silhouette of a dinosaur with a “long tail”, hence the name. Okay, so what do mosquitoes have to do with supply chains? We can extend the long tail concept to any product that has relatively low demand, sporadic demand or both; and for which demand is scattered across the globe. 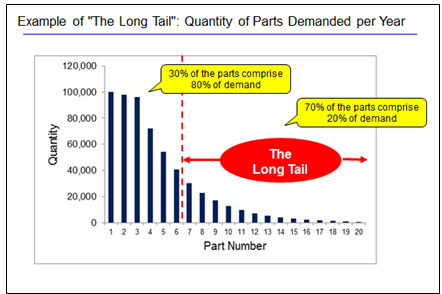 Instead of books, we can apply the long tail principle to spare parts for maintenance, repair and overhaul (MRO). Low inventories of low-demand products imply low fulfillment rates because of the relatively high cost to produce, store and distribute them. 3D printing addresses this issue directly by enabling higher fulfillment rates with lower inventories for these items. What makes this important on a global, cross-industry scale is that aggregate demand in the long tail can comprise 20% or more of total demand for a particular part. There was a time in the logistics business when “risk minimization” was limited to taking out insurance on a shipment against loss or damage. How times have changed! Today, the entire supply and demand network is perceived as operating within an environment of all types of risk. Insurance against cargo loss or damage has broadened to include insurance against all manner of commercial and geopolitical risk. What is more, risk management now extends to mitigation and preemption of these risks. Many of us who work in manufacturing or logistics are familiar with “normal accident theory”. I like to explain it as simply as possible, so my interpretation is the following: the more complex a process is, the likelier that some element of that process will malfunction. Here again, 3D printing has the potential to exert a profound effect on the supply / demand network across most industries. Large manufacturing facilities created to effect economies of scale depend on long and complex ecosystems for gathering their required inputs and distributing their outputs. 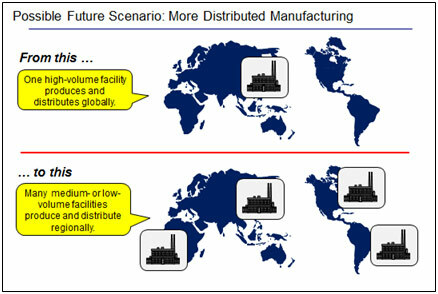 Locating production facilities closer to the customer in both the business-to-business and the business-to-consumer environment will go a long way toward mitigating risk of all types. These three economic drivers: scale, long tail and risk, reinforce each other in driving economic activity. Together, they pave the way for 3D printing to exert considerable impact on supply management. 3D printing will enable distributed manufacturing for many or most components in many industries. These distributed facilities will have higher unit costs owing to lower economy of scale, but higher unit production costs will be offset by reductions in transportation and distribution costs. Keep in mind that economy of scale will not disappear but, rather, its affects will be mitigated by other offsetting cost reductions. Because of low switching costs to move from one product to another, “long tail” products such as aftermarket parts, subassemblies or customized consumer goods will be more affordable and easily available. Customization is then enabled by low-volume production when that low-volume production is reasonably priced. Scale and “long tail” will move ahead at a pace driven by improvements in materials technology. As more materials amenable to application in 3D printing are developed, their adoption rate into the manufacturing process will increase. By its very nature, this will be a relatively evolutionary process. In contrast, the need to mitigate risk has become so important that it will serve as an accelerator to the adoption of 3D printing techniques. These changes will require significant responses from the participants in the supply chain to align their value propositions to the new order. We do indeed live in interesting times! Peter Canellis, PhD, PE, is Professor of Management at Vaughn College of Aeronautics and Technology in New York City.